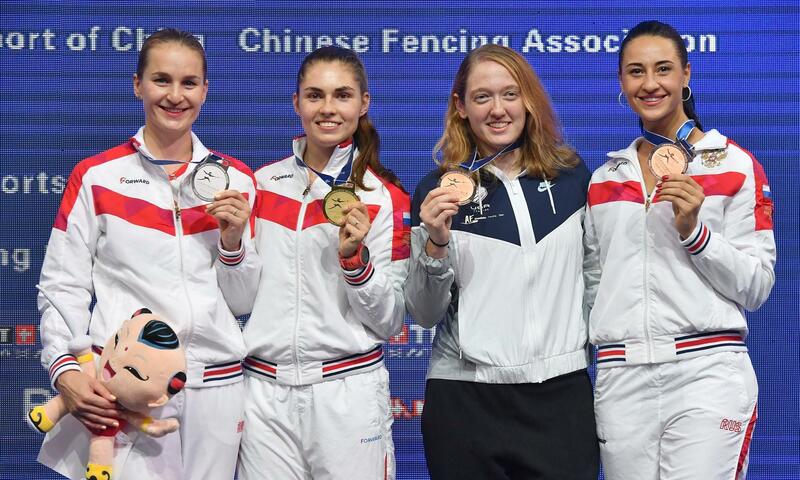 (Wuxi, China) – Eliza Stone (Chicago, Ill.) became just the fourth U.S. women’s saber fencer in history to win an individual medal at the Senior World Championships, taking bronze on Tuesday in her fifth appearance at the event. Stone, who previously won gold in the team competition at the 2014 Senior World Championships and bronze at the 2013 and 2015 Senior Worlds, secured the third individual medal for Team USA this week on the final day of individual competition. Unlike most U.S team members, Stone chose not to compete internationally during most of her collegiate career at Princeton, where she graduated in 2013 after winning the NCAA Championships as a senior. Despite her late entrance to the international circuit, Stone made an impact quickly with a silver medal at the 2013 Pan American Championships as well as Grand Prix and World Cup bronzes the following year. While she narrowly missed qualifying for the 2016 U.S. Olympic Team, Stone decided to continue to pursue her Olympic dream one more time and found it fitting that her breakthrough moment at the Senior Worlds came through exactly two years out from the start of the Tokyo Olympic Games. Ranked No. 26 in the world, Stone finished the pool rounds with a 5-1 record on Friday to take the No. 28 seed in the table of 64 where she opened with a strong win over Renata Katona (HUN) at 15-6. In the table of 32, Stone found herself tied with Karen Ngai Hing Chang (HKG) at eight touches each in the second period. With a one-touch lead at 12-11, Stone would pull ahead of Chang with a 3-2 run and take the win at 15-12. Stone fenced 2018 European Championships bronze medalist Svetlana Sheveleva in the table of 16. Fencing the Russian for the first time individually, Stone took an 8-7 lead and closed the bout with a 15-13 victory. Fencing in the quarter-finals at a Senior World Championships with a medal on the line, Stone took on Theodora Gkountoura (GRE) who upset World No.3 Anna Marton (HUN) in the table of 16. Stone ended the first period with an 8-4 lead, but Gkountoura scored four straight to open the second with a tie at eight. Stone regrouped to take a 14-11 lead before Gkountoura fought back to tie the score at 14. “When it was 14-14, I knew that I had to go for an action. Whether it worked or not, I was going to win or lose on my decision and I knew that I had an educated guess that that is what I should do. I just had to be brave and go do it … like my coach was doing the whole time,” Stone laughed. Throughout the bout, Stone could hear her teammates cheering for her from the rail of the seating area high about the stadium floor and said she felt bolstered by the support. With a medal secured, Stone advanced to the semifinals against Sofia Pozdniakova (RUS). The up-and-coming Russian star took an 8-3 lead at the break and won the bout, 15-6, before going on to claim the Senior World Championship title, defeating two-time Senior World Champion Sofya Velikaya (RUS), 15-13. “I was going to bring absolutely everything I had to the strip and, if it worked out, amazing. If it didn’t, too bad, but I was still going to do everything I could one bout at a time and not get too far ahead,” Stone said. Reflecting on her medal after the awards ceremony with the medal around her neck, Stone was in awe. On Thursday, Stone will return to the team competition with the goal of returning the podium as the U.S. Women’s Saber Team seeks a medal after the squad’s bronze medal finish at the 2016 Olympic Games in Rio. “I think we have an excellent team – Daga [Wozniak], Chloe [Fox-Gitomer], me, Mariel [Zagunis] – going into this team event. As long as we prepare well and bring out A game, we have a great chance. It’s just down to the day and down to our preparation. I think we’re going to do everything we can and we have a great shot,” Stone said. Stone was one of four U.S. fencers competing on Tuesday with Dagmara Wozniak (Avenel, N.J.) placing in the top 32 and Monica Aksamit (Matawan, N.J.) and Chloe Fox-Gitomer (Portland, Ore.) earning table of 16 finishes. Wozniak, ranked No. 9 at the start of the competition, drew Fox-Gitomer in a repeat of their semifinal at the Pan American Championships in Havana last month. Wozniak built a 8-3 lead after the first period, the 2016 Olympic team bronze medalist bested Fox-Gitomer, 15-8, to qualify for the table of 32. In the next round, Wozniak fenced Pozdniakova in a rematch of their table of 32 bout from the 2017 Senior World Championships. While Wozniak kept the score tied at four early in the bout, Pozdniakova went on to take the win, 15-10. Aksamit, who won bronze in Rio with Wozniak and Zagunis, fenced Chika Aoki (JPN) in the table of 64. Aoki led the bout, 8-4 at the break and went on a 7-2 run to win the bout, 15-6. Men’s foil fencer Race Imboden (Brooklyn, N.Y.) earned the squad’s best result of the day with a ninth place finish. Imboden began the day as the World No. 1 and was seeking his first Senior World Championship after ending the 2014-15 season as No. 1 in the world and placing top eight in the event in 2011 and 2017. With the score tied at four, Imboden scored eight straight touches to build a 12-4 lead and finished the bout with a 15-9 win. In the table of 32, Imboden fenced 2016 Olympic team silver medalist Jeremy Cadot (FRA) and took an 11-4 lead in the first two minutes. Cadot cut Imboden’s lead to 14-9 at the break and scored four straight in the second before Imboden scored the touch he needed for a 15-13 win. Imboden fenced 2012 Olympic Team Champion Giorgio Avola (ITA) in the next round. Avola tied the score at 10 and then outtouched Imboden, 5-1, to win the bout, 15-11. Miles Chamley-Watson (New York City, N.Y.), Alexander Massialas (San Francisco, Calif.) and Gerek Meinhardt (San Francisco, Calif.) were each eliminated in the table of 64. A 2013 Senior World Champion, Chamley-Watson led Alex Tofalides (CYR), 7-3, early in the bout, but was unable to advance with a 15-11 loss. Massialas, who won silver at the 2016 Olympic Games, was challenged by 2015 Junior World bronze medalist Mengkai Huang (CHN) who led Massialas, 12-6, in the table of 64. Huang pushed the score to 14-9 before Massialas countered with four touches in the last minute of the third period. Huang scored the final touch, winning the bout, 15-13. Meinhardt also attempted to make a comeback in his table of 64 bout when Daniel Dosa (HUN) held the lead 14-11. Meinhardt scored twice, coming within one of the Hungarian who scored once more to win the bout, 15-13. On Thursday, Imboden, Massialas, Meinhardt and Chamley-Watson will fence in the team competition. Together, the squad won bronze at the 2016 Olympic Games and made history this season, becoming the first U.S. squad to win five straight World Cup titles. The preliminary rounds of the team events also began on Tuesday with the U.S. Women’s Epee Team defeated Hong Kong, 45-30, in the table of 16. Kelley Hurley (San Antonio, Texas),Courtney Hurley (San Antonio, Texas), Kat Holmes (Washington, D.C.) and Amanda Sirico (Bowie, Md.) advanced to the quarter-finals on Wednesday against Estonia. In the men’s team saber rounds, Team USA was upset by Georgia, 45-38, after placing fourth in 2017. With the squad’s medal hopes dashed, the team would need to fence through three more matches in the 9th – 16th place table. The team shook up the lineup, putting Eli Dershwitz (Sherborn, Mass.) in as anchor against Ukraine after his silver medal win in the individual event on Sunday after slotting 2016 Olympic silver medalist Daryl Homer (Bronx, N.Y.) into the setup position. Homer put up 10 touches in the bout and Dershwitz anchored the squad to a 45-43 win with Geoff Loss (Laguna Beach, Calif.) contributing a +1 indicator to the team’s victory. In the next match, all four fencers competed with Andrew Mackiewicz (Westwood, Mass.) fencing with the team against Romania who won or tied seven of the nine bouts to win the match, 45-35. Fencing for 11th place, Team USA took on China and earned the win, 45-27, with Loss earning a +9 indicator, followed by Dershwitz at +7 and Homer at +1.